Spotify is already a great choice for people who enjoy stumbling upon new music, thanks to its discovery features and active community of curators. Now, there’s a new app you can use to find new tracks and artists quickly and easily – but be warned, it’s addictive. Discover Quickly does just what it says on the tin. Once you’ve connected your Spotify account, you can choose an artist, song, album, or playlist to surface other music you might like, and you can simply hover your cursor over the album art thumbnails that pop up to listen to a clip instantly. If you like what you hear, you can save it to a list in the web app, save it to your Spotify library, or add it to a playlist of yours. 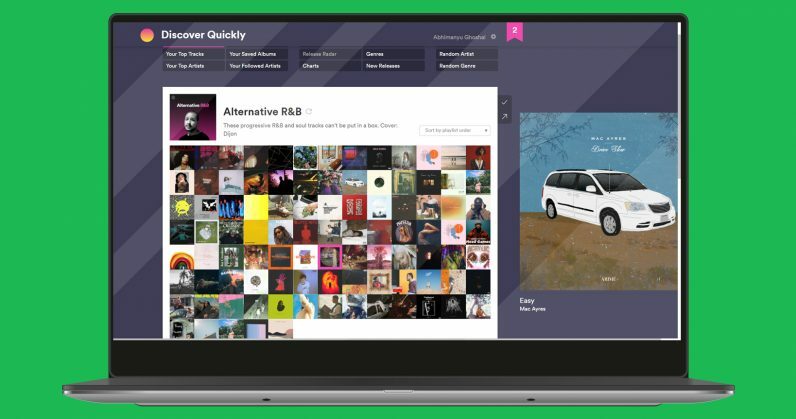 The developers behind this tool – two Spotify employees who built Discover Quickly at a company hackathon – acknowledge that most of this functionality is already available in Spotify‘s app. However, the intuitive visual approach to displaying artists and albums, as well as the nifty hover-to-listen feature, work beautifully to help you find tunes that you’ll enjoy – more so than what Spotify‘s apps already offer. I’ve been using it all morning to round out my library of alternative R&B music, as well as guitar-led instrumental records. It works like a charm, and is especially handy for building playlists quicker than ever before. Give the app a go by visiting this site and logging in with your Spotify account.